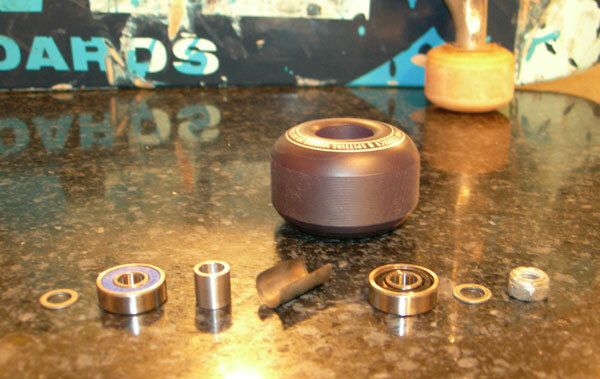 So many lousy bearings are available to the skater today, it is amazing that wheels still roll. Some products do stand out as being better than the rest. I suggest these bearings for use in cement skatepark or street environments where 99% of skating is being done today. Dirt contamination is the #1 enemy of the skater, followed by proper mounting and alignment issues. The bearing's ABEC level is rarely a problem. Most skate companies flat out lie about their ABEC rating being any more than an ABEC 1. ABEC stands for Annular Bearing Engineering Committee of the AFBMA (American Bearing Manufacturers Association Inc.) (ANSI/ABMA/ISO 3290). 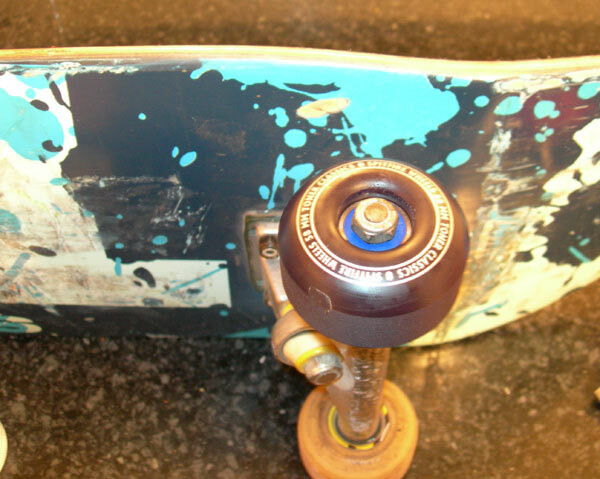 In my opinion, a well designed 608 skate bearing should include: 6-7 balls, dual labyrinth seals (or at least an outer labyrinth seal and an inner shield), quality steel construction, delrin or phenolic cages, and a light grease lubricant. The bearing set should also include a set of precision spacers. * Bones Swiss - THE STANDARD for speed, but suffer from poor sealing and lack of a quality spacer. * Oust Bearings, Inc. - High quality labyrinth sealed bearings and precision spacers. Very nice! * Biltin Bearing - A lower grade, poorly sealed bearing, but with a superior integrated spacer system. 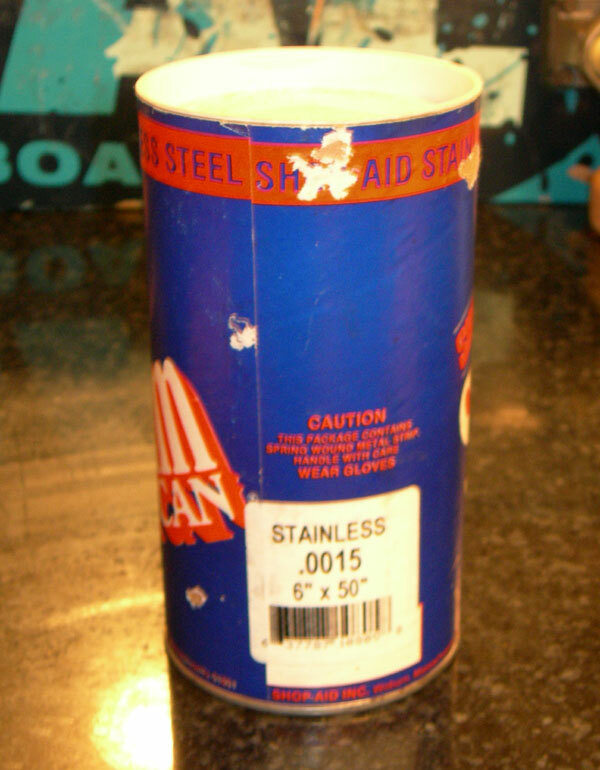 * SKF FREEstyler bearings - Well sealed and by a name brand bearing company. No spacers. * NTN Formula Extreme Skateboard Bearings - Well sealed and by a name brand bearing company. Spacers! By using a quality bearing and going through proper skateboard preparation you can maximize bearing life, increase speed during high side load, give the rider superior feedback, and improve slide control. Free spin has almost no affect on bearing performance while riding, do not worry if your bearings do not free spin forever, riding is the test. When a skate wheel has been properly installed, the axle nut is fully tightend to proper torque and a very slight amount of play is felt in the wheel. This play will be play within the bearing itself rather than over the axle. Free spin may not be great, but free spin is not a valid test of proper installation of a skate wheel. It is so important that bearings be mounted on the axle well. 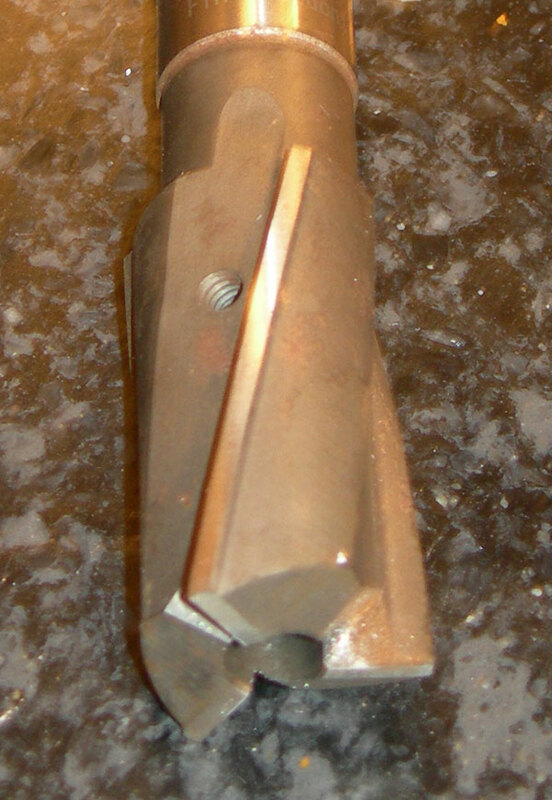 The hanger face should be machined perpendicular to the axle (a counterbore w/ pilot removed works well, MSC #08790644). 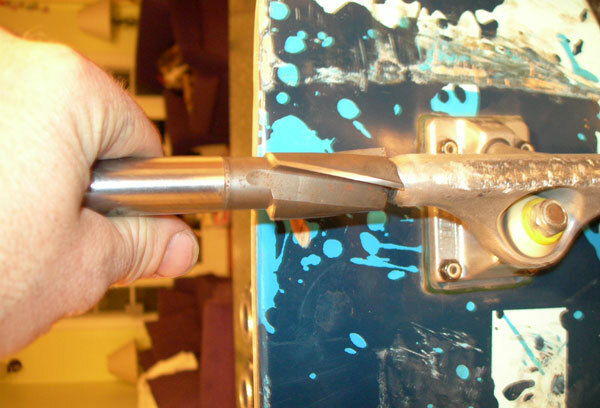 Skateboard axles are undersized 5/16" shafts and are on average 0.004" (dia.) less than what the 608 bearing's 8mm bore requires. The axle diameter should be shimmed up to 8mm (.3149")(usually, .0 015-.0020" stainless steel shim stock cut to .951" long x.977" wide works well). Curling the shim over the back side of some sissors makes it easier to get the bearing over while holding the shim on the axle. In a perfect world, the bearing spacer (between the bearings) would be made of HT 440C stainless steel or HT SAE 52-100 Chrome Steel, ground to bearing tolerances, just like the inner bearing race would be. 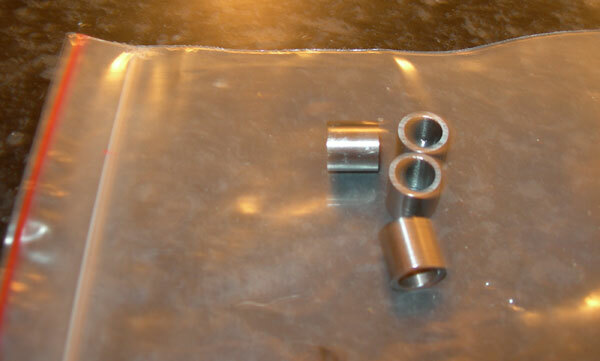 303 Stainless or 6-4 Titanium can be used as a spacer material. Aluminum can only be used as a spacer material in a skateboard bearing assembly when the wheel nut is firmly toruqed against the system. Aluminum can not handle the abuse of the loosly installed environment and will change dimensionally in time. Also, Aluminum spacers that show up in skate bearing kits are almost always too short and are, obviously, of the poorest quality. The Oust Spacer is made of aluminum, but I have spoken to them and they have assured me that it is of a very high grade 7000 series alloy that will hold up. I am testing tham now, and they seem to be holding up. The key to having the oust aluminum spacers and washers hold up, would be ensuring that the axle nut was fully tightened, eliminating any sort of play between the bearing and the spacer. This in theory includes shimming the axle to 8mm. Do yourself a favor and get some of the Oust Spacers or ABEC11 spacers and a quality core wheel. The spacer should usually have a length between 0.400" to 0.440" (skateboard spacing standard plus wheel core tolerance) or 0.300" to 0.340" (roller skate standard plus wheel core tolerance) . Each wheel must be measured individually to find the exact spacing and the spacer must be at least 0.005"-0.010" over this dimention. Some companies are far better than others when it comes to holding this dimension in the wheel. I find that most wheel bearing spacing runs between 0.405" and 0.420". It is always better to space the bearings a little too much than too little. For Builins, it may be necessary to place a 0.005-0.040" spacer shim between the bearings and the spacer since Biltins are cut to exact .400" spacing (duh...Chris!!). This is true for the Oust spacer as well (duh..Karl!!) and it is that way for Powell as well (George, even you?). This step prevents the bearing from running in a higher friction, overly preloaded state. Oust is currently the only manufacturer besides Builtin/ABEC11 that is seriously considering bearing alignment as well as the bearing itself. It is just too bad that they took such a nieve approch and did not bother to measure the wheels on the market. Myself and my sponsored riders are currently using custom made 4130 bearing spacers. I personally machine them and fit them to each wheel. For me, only the best will do. The axle nut should be tightened firmly. The only detectable play should be coming from the bearings themselves, not the fit over the axle. For all but Biltins, an 8mm x 11.5mm washer should be placed on either side of the wheel assembly.Selecting a wheel with a high quality core insert will assist in keeping the outer races of the bearings aligned (faster) as much as current skate technology allows. Proper mounting of the outer races requires machined metal cores with fixing rings to lock or preload the outer rings in position. This practice is well beyond the reach of common skate wheel price points. Even in cycling, I know of only one company mounting hub bearings like this , Hadley, a very rare case. Motorcycles manufactures do not even bother with this, but both of these examples do use precision press fit bearings in metal hubs. 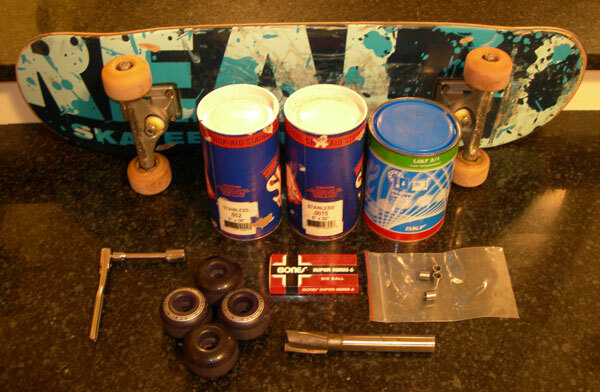 A sealed and greased bearing is preferred to one that is oiled due to the fact that skateboarders simply do not clean and re-lube at intervals even close to necessary for oil use. Meticulous racers should run an oiled bearing, but only if they clean and re-lube throughout the day. A greased bearing is basically maintenance free, but can be cleaned and re-lubed if need be. See SKF's site HERE for cleaning details. 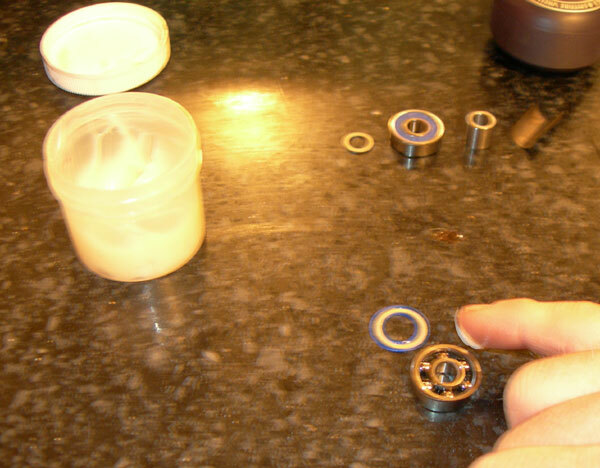 The bearing cartridge is not to be packed full of grease, only enough to coat the actual balls (20% of open space). To much grease causes unnecessary friction. NTN has an excellent article on bearing lubrication HERE and another article on care and failure analysis HERE. Torco has an informative artical on grease HERE. 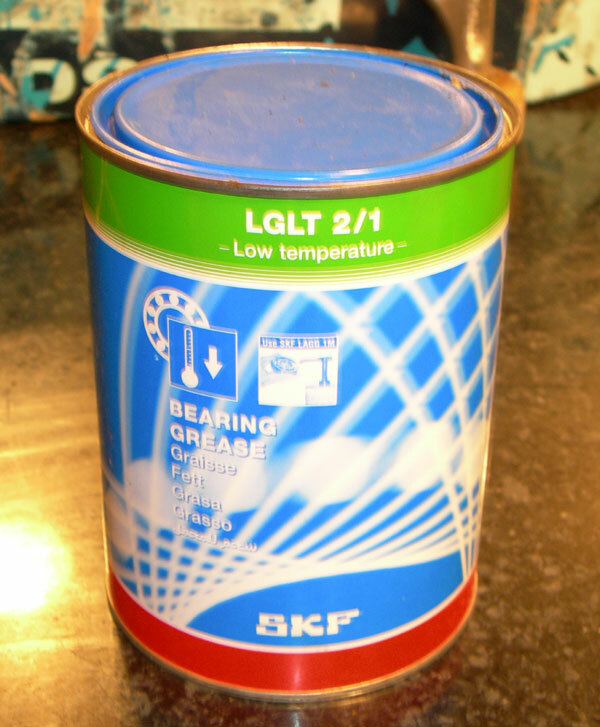 SKF Grease LGLT 2, polyalphaolefin (PAO) synthetic base oils grease with a lithium soap thickener (NLGI Grade 1.5) is considered the standard bearing grease for general skate use. This is some expensive stuff. Maintenance Products Direct caries it and it sells for $80 per 1.0 kg. I have a tub of this an would be willing to sell some. If oiling bearings for max speed, exactly 2 drops of an ISO 13 oil should be applied. may be ok. Basically you need a grease rated at MIL-G-23827. To understand some more details regarding grease specifications read THIS.About the best way to get grease or oil into a skate bearing is by using a syringe. I found some cheap suppliers online. Microtools has a good selection, at good prices, with a variety of needles to choose from (15 guage works well). A standard 608 bearing has 7 x 5/32" balls inside held evenly spread out by a delrin or brass cage. Without a cage, 11 x 5/32" balls can be squeezed into the constraints of the bearing. The more balls in the bearing (ie. high capacity), the stronger it is radially, but not axially (due to filling slot necessary to fill this type of bearing). Also, some friction issues can arise if the balls are allowed to rub against each other, but this is not mission critical on a well greased bearing. The general consensuses is that fewer balls make for less friction with the same axial strength. In some discussions that I have had, special reshaping of the actual race shape and the use of larger balls is required to use fewer balls. I have tested some 11 ball bearings and they do seem to ride slower than the standard 7 ball bearings. A general article on bearing quality is available HERE. An article making reference to axle fit is available HERE. I would love to ask Danny Way if he has a problem with wheel spin-up when he is re-entering from his massive jumps.